Is there a higher risk to your pregnancy because of toxoplasmosis? Taking into consideration that, statistically, during pregnancy, chances of giving birth to a child suffering from certain defects are about 5%. Therefore, during this period of your life, you are advised to be very careful and in constant contact with your medical care provider. One of the things you should be aware of is toxoplasmosis. Toxoplasmosis is a type of infection triggered by a parasite called toxoplasma gondii. Most commonly, one suffers from this infection after eating undercooked, contaminated meat or getting in contact with the infected soil or cat feces. If you desire to learn more about this condition, read on. 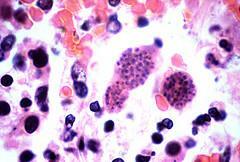 About 85% of all pregnant women in the US are at a risk of suffering from toxoplasmosis. The group being especially susceptible are women who have cats in their households or outdoors, those who consume undercooked meat and those who do the gardening on their own. Also, individuals who have suffered from an infection related to mononucleosis or some similar type belong to the risk list. In order to make sure that you are safe from toxoplasmosis before you become pregnant, it is best to take the necessary medical tests prior to the conception. However, you can prevent toxoplasmosis by changing your lifestyle a bit and being more aware of the presence of this parasite in the world around you. Thus, make sure you avoid consuming undercooked meat. When you are preparing meals, cook the meat until there are no pink and purple parts left and until all the juices coming out of the meat are completely clear. Also, if you do the gardening, wear protective clothes and gloves. In case you own cats, stay away from their feces and avoid feeding them raw meat since these factors increase the chances of toxoplasmosis affecting both the animal and you. Additionally, make sure you wash all the fruits and vegetables you are eating before consumption. The infection has to be an ongoing once, still active in the mother, in order to actually cause harm to the child. Thus, if you have suffered from toxoplasmosis in the past and have gone through the process, there are great chances that you are immune and that your child is protected. However, this infection can be dangerous if it affected you 6 months before pregnancy or even earlier. Bear in mind that between 400 and 4,000 babies are born with toxoplasmosis annually. Note that, in the US, 1 in every 1,000 to 8,000 babies is born with this parasite infection. If the infection affects the mother in the period between weeks 10 and 24, the chances of the baby suffering from some serious health problems are minimal, being about 5%. Yet, if the baby does get affected, he/she can experience premature birth, low birth weight, fever, jaundice, retinal abnormalities, abnormal size of the head, brain calcification and convulsions. If the mother suffers from toxoplasmosis while in the 3rd trimester, the baby is not likely to suffer from any health problems, due to the fact that he/she has already gone through all the important stages of physical development. About 15% of all women are born with the antibodies necessary for fighting off toxoplasmosis or have aquired them during their previous infection. On the other hand, the other 85% are not so lucky, even though only 0.4% actually get infected. Either way, you can keep yourself and your child safe by exposing the meat to at least 150 degrees, destroying the parasite and its cysts and making sure that the levels of hygiene in your household is high. Stay away from the cat litter and cats themselves during your pregnancy is a great way of reducing chances of toxoplasmosis. You should know that toxoplasmosis is not a common condition. In fact, congenital toxoplasmosis appears in only 0.1% of all babies in the US. Out of this small number of sufferers, only some of them actually experience any symptoms. These individuals can suffer from either severe or mild case of toxoplasmosis. Namely, 10% of all toxoplasmosis patients actually experience the symptoms and these are most commonly mild, resembling a case of common cold. Yet, for keeping yourself completely protected, you are advised to seek medical opinion on your condition. As for the cat and the litter box, try and avoid these during your pregnancy. Let someone else takes care of cleaning the litter box and tell this person to boil it in hot water at least once a week, for disinfection. All in all, toxoplasmosis can pose a risk to your pregnancy and you should be aware of this danger. However, the chances of actually suffering from any of the symptoms mentioned above are really small. Nevertheless, you should be careful regarding your hygiene and lifestyle, doing your best to prevent toxoplasmosis. If you happen to experience any symptoms or have any worries, seek medical assistance as soon as possible and have the problem sorted out.